All are pre-wired for instant operation. Just cut a small opening in your layout to install from below. Each unit is equipped with mounting brackets set at 3/4''. However, we can set them at any dimension you like. Click on Product Image for specifications and an enlarged view. You can now use the Buy Now option to purchase securely online. Many of our products now offer video. Click here for video FAQ. Remember the gasoline model airplanes of the fifties and sixties that flew on a string line? This is a recreation of a man flying such an airplane. The figure moves in a complete circle as he flies the airplane. This animation may be used in a playground or backyard scene on your layout. Perfect companion to our see saw, swing set, and merry go round. Fully landscaped as shown. Requires an opening of 7'' x 5'' x 3". This animation includes four children riding the swings and glider as the mechanism allows them to gently swing back and forth. It may be used in a playground or backyard scene on your layout. It's a perfect companion to our see saw, merry go round, and man flying the airplane. Fully landscaped as shown. Two children gently move up and down on this popular playground ride. Includes all figures as shown. Perfect for a playground or backyard scene on your layout. Great companion to our swing set, merry go round, and man flying the airplane. Fully landscaped as shown. Realistic, electronic, flickering orange and red flame. Real smoke rises from the fire. Fully landscaped with campfire and hobo figures. Optional sound unit available. Realistic, electronic, flashing blue cutting torch flame. Real smoke rises from the "cutting" area. Can be customized with any rail to match your railroad! Fully landscaped as shown. The 'O' Scale painter's arm moves up and down as he appears to paint this illuminated lamp post. May be used in any area on your layout. Fully landscaped with ladder, paint cans and tarp. This 'O' Scale figure moves in a semi-circle as he appears to water the lawn. The figure reverses to move back and forth and may be used in any area on you layout. Beautifully landscaped with brightly colored flower beds. Can be custom landscaped any way you choose. The figure moves in a circle appearing to mow the lawn. He then reverses at a pre-set time, turns around, and goes in the opposite direction. The "cut" area appears shorter than the surrounding lawn. Can be landscaped as a realistic park or playground scene. May be customized for use in front of or behind a home, or anywhere a lawn is needed. Requires an opening of 12'' x 8'' x 3". Perfect for your street, sidewalk scene, or any place you feel "construction" is needed. Watch as the jackhammer operator breaks up the street and kicks up dust. Fully landscaped as shown with construction workers and barracades. Includes fire hydrant and U.S. Mailbox. Gargraves track section fits perfectly on a siding or spur. Get the best of both worlds as this piece combines our popluar arc welder and the construction crew in a railroad setting. The jackhammer operator breaks up and "tamps" the ballast between the rails while the welder "cuts" the track rail. Includes operating Arc Welder with smoke and jackhammer operator. Can be customized with any track to match your railroad. Fully landscaped. Easy installation. This unit includes two separate sound sets. Jackhammer sounds work in conjunction with the mechanical action of the jackhammer operator. The "track crew" and "cutting torch" sounds operate all the time. There are separate volume controls for each sound set. Requires an opening of 8 1/4'' x 6 1/8'' x 3". This animation depicts a trackside scene of a train shed with exterior illuminated light. The chimney on the shed smokes continuously. A Gargraves track section sits adjacent to the shed and next to the track is a brakeman holding a realistic flickering lantern. Any type of track can be used. This unit matches up to the track crew perfectly to create a two-piece diorama that has to be seen to be believed. Fully landscaped and easy installation. This animation depicts a scene of a road crew resurfacing the highway. An 'O' Scale asphalt roller moves forward and back as it "flattens" the blacktop. Construction Crew figures accentuate the action. Fully landscaped as shown with die-cast construction vehicle. Requires an opening of 8 1/4'' x 6 1/8'' x 3. The custom playground combines three of our most popular animations. The See-Saw, Merry Go Round, and Swing Set are fully operational to provide non-stop action that will compliment any layout. Includes extra figures and sidewalk. Add-on sound unit available. Extremely realistic. A young man flies his kite. You will be amazed at the realism as the kite rises and falls in the breeze as if it's a warm summer day. This motorized animation will impress all who see your layout. 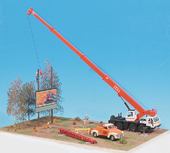 Workers and a large die-cast crane raise and lower a commercial billboard in the air and into place. Beautifully landscaped with Scenic Express Supertrees in a country setting. Mechanism reverses itself for repeated action. As seen on the Choo-Choo Barn layout. Scary cemetary completely landscaped with grave robbers, pine coffin, and trees. The scene is accented with an ivy covered mausoleum, tombstones, and statues. Large Suethe smoke units simulate for throughout the animation. Included are random digital sounds of wind, bats, creaking gate, screams, thunder and other haunting sounds. Motorized coffin moves in and out of grave. As plumes of smoke and flames billow into the sky, experience the heat, smoke and danger faced by fire fighters every day with the latest from Willard Animations. Add a touch of drama and excitement to your layout with this realistic and amazing accessory. Connect this accessory to your Lionel CAB-1 and when activated smoke will billow from the structure along with the sight and sound of roaring flames. Activate the pumps and the sound of fire trucks with bells clanging and sirens blaring can be heard while the fireman sprays real water to extinguish the smoke and flames. Position this accessory on your layout where ever desired. Includes die-cast fire engine and duel digital sound system as shown. TMCC capatible (you must have a Command Base and CAB-1). This Billboard features a retro 1930's - 1940's cigarette advertisement of Camel or Chesterfield cigarettes (your choice). The model #024 is illuminated with two brass mounted lamps and a Midwest laser-cut hand-stained wood structure that supports the billboard. The billboard frame is accented with a flat green paint that evokes this bygone era. Two advertisements are available. 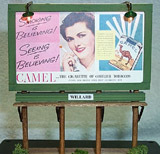 The Camel woman or Chesterfield man is smoking a cigarette that is illuminated with a very rapidly flashing miniature lamp that gives the appearance of a lighted cigarette. Either model is available with the Camel or Chesterfield cigarette advertisement. Please specify when ordering. The Railcam is a wireless color TV camera with audio that allows you to watch or videotape your railroad in action. Imagine being small enough to ride in a train on your layout. What does it look like as you travel along the rails through tunnels, industry, cities, and country? See "O" scale as never before as you get a bird's eye view of the towns you've created and see accessories operate up close. And now for the first time, hear those fantastic Railsounds, Protosounds, Crewtalk, and Towercom announcements. Stage an entire show, record it, and play it back anywhere. Create a videotape and send it to family and friends who may in the past have never been able to see your train layout operate. Send the signal to your computer and burn the video on a CD. The Railcam transmits audio and video to any television in your home. The possibilities are endless. This animation creates the realism of an actual baseball game. Experience the sights and sounds of America's favorite pastime. Join the crowd in the occasional "cheer" as the umpire yells "strike". Here the hot-dog vendor calling "get your hot dogs". Five animated players include the batter, pitcher, center fielder and 1st and 3rd base runners. The batter actually swings his bat. The pitcher raises and lowers his arms as he winds up to pitch. The center fielder drifts back to the wall to catch a fly ball. The runners on first and third base take leads as they move back and forth. A cable connected remote panel provides control over the player action, sounds and the outfield light towers and scoreboard lighting. Detail like you've never seen before in an animation. Overall measurements are 25" x 25". This is a custom built piece that must be pre-ordered in advance. There is a 50% deposit required at the time the order is placed. Drive-in with your best girl or a carload of friends and experience an era long gone but not forgotten! Step up to the snack stand for a "Coke" and a hot dog. Or maybe you'd like an A & W Root Beer and some popcorn. Anyway the show is about to start. It's a warm summer night and its time to relax and watch you're favorite movie. Forget all your cares and sit back! We'll customize the marquee for any movie you like. The self-contained DVD player will show any movie in your library or play our special one with old intermission and snack stand favorites you might remember from the 1950's. Either way its a wonderful step back in time for some great old memories. You'll want to add this amazing animation to your layout. It's sure to attract attention long after your trains have circled the tracks. We have motorized the Lionel postwar #460 Piggyback Platform from the 1950’s. With only slight modifications to the original design you can now remotely locate this accessory anywhere on your layout for realistic operation. A small opening in your layout is required. This accessory is now very exciting to operate. You can rotate the forklift truck clockwise or counter-clockwise with the rocker switch on the control panel. Lift and lower the truck with the pushbutton on the supplied control panel. Order two or three units for a real trucking operation!